The real quest was spending all of last night trying to play with another human. My time in Outward, Nine Dot Studios' sandbox RPG, has been full of entertaining disasters. I've managed to achieve little of note, but I have been beaten up and kidnapped by wolves, beaten up and kidnapped by bandits, forced to fight for my captors' amusement, and then I was kidnapped by wolves again. A big lobster electrocuted me once, too. All in all, it's been a fun misadventure. Until I tried to play with another human. Co-op has been touted as a big feature ever since it was announced, and it's such a wonderful emergent storyteller that it's exactly the sort of thing you'd want to share. 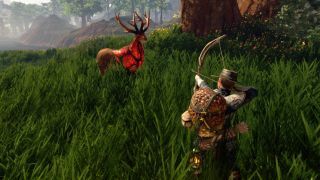 Outward has local split-screen and online co-op, but for a lot of players, attempts to play online ended in frustration and failure. Luckily, today's patch aims to fix that. Last night I spent the entire time troubleshooting our inability to play together, but every attempt to find a game came up empty. The issue was exacerbated by the online co-op system being as barebones as it gets. There's no game list, no menus and definitely no frills. The host types the name of the game into a text box, and then the guest types that same name. It should connect the pair, though it wasn't until the patch. Chris is working on his review and had better luck playing with Wes. It took them a few tries, but eventually they were able to play together without further issues. Hopefully I'll have better luck not getting kidnapped by wolves tonight. Take a look at the full patch notes below. Fixd issue where searching for an existing game would always return a 'game not found' message error. Controller joystick sensitivity is now affected by the setting 'camera sensitivity'. Bandit Camp in the south in Chersonese's map has been moved to fit its actual position. Each elevator in the tutorial can now be toggled with their respective levers. Added a workaround to force all controllers to be assigned to the second player in split screen (for those having the issue of all controllers being assigned to player 1). Player 1 will only have the mouse and keyboard. It is temporary while we make an actual menu for controller assignation. To toggle this workaround, add a txt file named "CONTROLLERP2.txt" in 'Outward_Data' which is Outward's install directory.